Many wristwatches are sold in our silver and jewellery auctions each month and are of particular interest to collectors. Wristwatches are the most common type of watch used today and became popular in the 1920s. Rolex. A Gentleman's 9ct Gold Cased 'Prince Classic' Wristwatch (FS17/269), which realised £3,800 at auction. At auction today, you can purchase a wristwatch with the following movements: automatic, quartz, mechanical and electronic, with either analog or digital display. Analog being the most traditional. Rolex and Omega wristwatches are particularly collectable and are almost always featured at auction. When in good, working condition, these watches are even more sought after. Breitling, Cartier and Patek Philippe are also collectable. A Lady's Platinum and Diamond Mounted Cocktail Wristwatch (FS17/270) fetched £720 in the watches section of the January 2013 Fine Sale. As well as the make of a wristwatch, the value can be determined by the movement, import marks, precious metal and/or diamond weight. 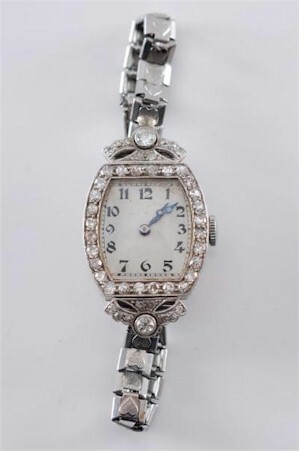 A lady's cocktail wristwatch is often set with diamonds and, when in good quality, can sell exceptionally at auction. 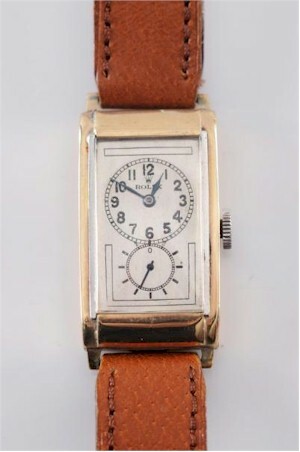 There are a wide range of lady's and men's wristwatch 'styles' to choose from at auction, appealing to all buyers.